Reading palms is likely to have started in the Far East as long ago as 4000 years, it is mentioned in ancient Hindu scriptures and The Old Testament. 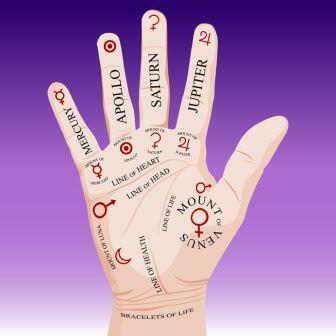 It is thought hand reading, also known as Palmistry and palm reading spread in popularity throughout Greece and the Roman Empire and has been practised in one form another ever since. There is a difference between what your dominant and passive hand can tell you. Generally, your dominant hand (the one you write with), reveals the aspects of your personality and how others perceive you. It can also assess your talent, your health, your life in general and likely future successes you will have. Whereas your passive hand is much more about your potential, your imagination and your instincts. Air Hand: This shape is characterised by long fingers; the person craves excitement and looks for new things to do and explore – they are likely artistic. Earth Hand: This hand is denoted by a square shaped palm and short fingers. These are down-to-earth folk, they have lots of energy and are both practical and reliable. Fire Hand: The palm will be long in shape, but the fingers will be short. For this hand type it is all about living life to the fullest, they often have a lot of drive and are sporty. Water Hand: Long slim fingers, accompany a long palm on this hand. These folks are usually quite ‘dreamy’ in personality, they are caring and sensitive people. The second step is to look at the mounts (sometimes called fleshy pads), which sit at the base of each finger and on the palm. The size of the pad, really denotes how strong or weak we are in each area.